Popularly known as the "Conch Republic" and storied in its history, Key West, FL is a favorite stop on the cruise log for tens of thousands annually. Its charming architecture, the fun-loving attitude of the locals and the many funky restaurants, shops and souvenir stands make for an energy-filled vacation destination. Perhaps the only frost-free community in the United States, Key West offers visitors a welcome Caribbean breeze, plenty of fishing and boating, beach strolls and some of the most unusual specialty shops on the planet. Cruise ship traffic is heavy in this town, which serves both as a destination and departure point. Most of the larger vessels anchor near the Truman Annex at Pier B, at Malloy Square or at the Navy Mole adjacent to Fort Zachary Taylor. If arriving or departing from the base location, a trolley service takes visitors from the cruise pier to the waterfront near the center of town. The Truman Annex dock has visitor information booths, souvenir shops and ATMs on the site. 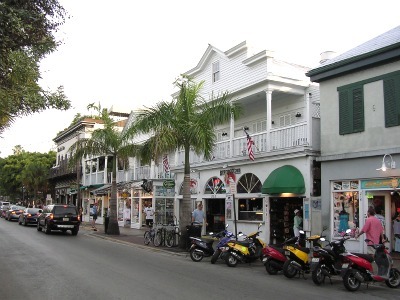 Key West has a long and varied history, having been in existence since the early 19th century. A walking tour that takes visitors away from the bustling waterfront and into the heart of the community soon reveals a number of charming mansions and restored manor houses. 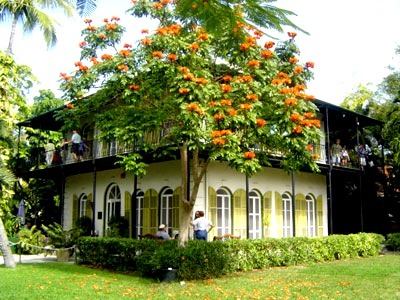 The famous home of Ernest Hemingway is located at 907 Whitehead Street and is now a small museum, complete with the old writing studio which was left intact. The swimming pool on the property is the oldest in the city, and the many cats that wander about the house are direct descendents of the late writer's pets. The two mile long Harborwalk is a never-ending street of curios shops and snack restaurants, and will delight visitors for hours. The Key West Aquarium, located on Whitehead Street, is the oldest attraction on the island, and has one of the most amazing seahorse displays to be found anywhere. Also on Whitehead Street is the famed Audubon House and Tropical Gardens, named after the famous painter and birdwatcher. Rare prints by the artist and the immaculately kept grounds are a highlight of the visit. And of course there are a number of seaplane and boat tours departing from the marinas along the waterfront, which is a favorite spot for photographing the many schooners and other boats that never seem to stop cruising by the city center. Aside from shopping at the huge number of gift shops in town, the community is perhaps best known for its unusual dining establishments. The A & B Lobster House on Front Street serves the best lobster platters in town and also has a full service cigar bar. Mangoes is a favorite stop for visitors and is renowned as a people-watching establishment. Near Mangoes and also on Duval Street is the local's choice - Louie's Backyard. The outdoor deck is right on the water's edge and the sound of the breakers on the beach below is memorable. Not to be forgotten is Pepe's Cafe and Steakhouse on Caroline Street, which serves the best omelets around and has a huge assortment of grilled meat entrees. Most visitors prefer to walk, since the town itself is rather small in size. Tourists can make the walking trip from one end of town to the other in less than 20 minutes. Besides, the community is set up to serve the visitor with its centrally located curios shops and restaurants. The locals enjoy getting around on bicycles and mopeds, and tourists can rent these from a number of vendors in the Duval Street area. Conch Cruisers, which are battery operated open-air vehicles, are a good way to get to one of the landmarks once the feet get tired. And there are plenty of taxis that take cruise visitors from the docks to the center of town. Public bus service connects the city to the rest of the Florida Keys and then eastward to Miami. The Old Town Trolley Tours offer another alternate means of transport and are extremely fun for the kids. Key West is a part of the State of Florida, and as such uses US Dollar as a currency. There are a number of banks that will exchange funds from several of the Caribbean republics. Some of the restaurants have Wi-Fi connections, with or without purchase depending on the merchant, and there are plenty of telephone booths in the hotel lobbies and near the cruise docks for those who have left their cell phones at home. The house where Ernest Hemingway lived and wrote his masterpieces. A beautiful beach on the Key West island. Duval Street - a place with many interesting shops and restaurants. 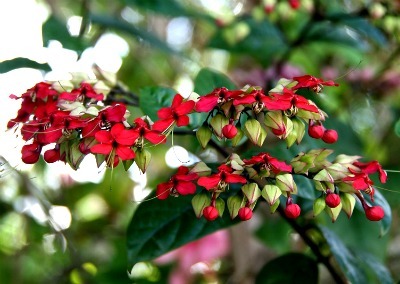 A beautiful scene inside the Audubon House and Tropical Gardens. 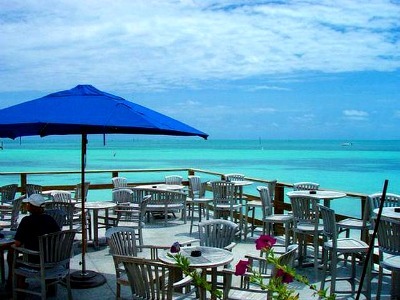 Louie's Backyard - one of the most popular dining establishments on Key West.